Wow. 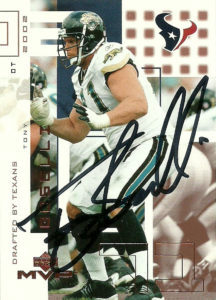 Tony Boselli really made me wait on this one, signing 2 cards in almost 1600 days. You have to hand it to the mailman. Just as you think they are stealing your mail, you get a long shot wait like this one. 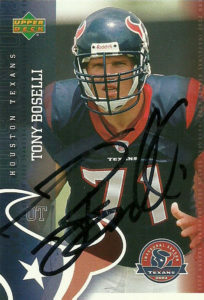 Tony Boselli was the anchor of the Jacksonville Jaguar franchise at left tackle. He was their first draft choice in 1995, and quickly established a reputation as one of the finest linemen in the NFL. A very popular player during his tenure in Jacksonville, he provided a much needed face and leader to the young franchise as it matured under Tom Coughlin’s watch. A 5 time Pro Bowler from 1996-2000, and 3 time All Pro from 1997-1999, Boselli was named to the 1990’s All Decade NFL Team. He’d sign a massive, new contract with the Jaguars, but by 2001 the injuries and weightlifting had caught up with him. It was possible that Tony’s bad shoulder might end his career. Facing salary cap hell, the Jaguars made Tony available for the Houston Texans Expansion Draft in 2002. The deal was, if the Texans took Boselli’s massive contract hit, they’d leave NT Seth Payne and DE Gary Walker on the table for the Texans to draft as well. For the Texans, the risk was Boselli might never be able to return form and Houston would have to absorb his salary cap hit. It seemed that the benefits outweighed the risk, so the Texans selected Boselli first overall during the expansion draft. He’d be the first and only player in the history of the league selected first by two expansion franchises. The Texans immediately trotted Tony out as an ambassador of the franchise. He’d appear in numerous photoshoots and in pads touting the young Texans franchise, but as time and seasons passed, it became more and more obvious that Boselli was not going to see the field again. He’d retire from football in 2004 or 2005, and sign a one day contract to retire as a Jaguar in 2006, and joined the Pride of the Jaguars Hall of Fame. While Tony has been nominated numerous times as a preliminary candidate for the Pro Football Hall of Fame, he never made it past the first round until 2016 where he made it to the final round. Perhaps due to his injury history, short career, playing for a smaller market, and at a relatively unglamorous position, has kept Boselli out of the Hall at this point, but in the meantime that has not slowed him down any. A humanitarian at heart, Tony has his own charitable organization, and gives back to the community primarily in the Jacksonville area. He coaches football and does color commentary as well and was a minority owner at one point of the Austin Wranglers of the Arena Football League. A savvy businessman, he owns some local Whataburger franchises, and a marketing company. 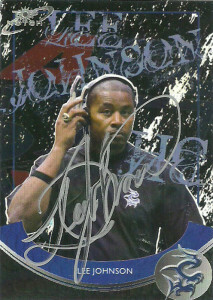 Coach Johnson is a veteran of many leagues as both a player and a coach. He’s spent time in the NFL, CFL, NFLE, and AFL. Among his highlights, Johnson coached the defensive line of the Berlin Thunder to two consecutive World Bowl Championships in both 2001 and 2002. He then coached the Denver Crush to the Arena Football Championship in 2004. After taking the reins of the Talons, he coached them to a 14-4 record and a division title, in 2012. After the San Antonio Talons game against the Iowa Barnstormers I gave out my custom cards to many players on the field. It created such a stir that Coach Johnson came over and asked me where his was. After I joked with him a few seconds about sharing the same first name, he quickly extracted a promise from me to make a custom for him as well. I arrived at the Talons game versus the Voodoo early as usual. After talking to the COO of the Talons and giving him a copy of the set, he went over to Lee to show him what I had done. Coach immediately came over and talked to me with a broad smile, signed the card and thanked me for the extras. He asked me what I wanted for the cards I made and gave to him, but as usual the most important thing for me is the autograph gracing the card for my own collection, and their enduring happiness and willingness to chase their dreams. You know, on that note, I have always subscribed to the ultimate belief that a true gift is one that is not expected, and for purposes of what I had given to each of these players I know it meant a lot to them. My cousin got me a game program full of autographs back in 2004, that I found recently when digging through some boxes. While the AFL was quirky and entertaining playing in “The Drum” (Frank Erwin Center), their legacy did not last, as the franchise packed its bags after 4 seasons. Jeremy Beutler was originally claimed by the Carolina Cobras in 2000, but opted to play for the Frankfurt Galaxy in the NFLE for 2001 recording 2 sacks. In 2003 Jeremy would sign with the Dallas Desperados playing there for one season before joining the Wranglers for the next two. In 2006 Beutler played for the Kansas City Brigade recording 14.5 tackles and a sack before retiring after the season. Beutler’s best season probably came in 2004 when he recorded 47 carries for 133 yards and 6 touchdowns. He quickly entered coaching and became the offensive line coach of the Wranglers, but the team wrapped up operations after 2007.